NOTICE: Product will be packed cold for freshness with ice packs in a cooler or insulated foil bag. We will ship expedited even when you select ground for shipping. Cacique. We only ship refrigerated products from Monday thru Wednesday so they don?t travel during weekends. 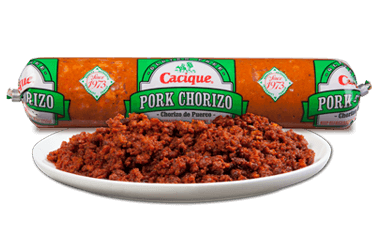 This pork chorizo is U.S. inspected and passed by the Department of Agriculture (EST.871), made in California. Please keep refrigerated or frozen upon arrival. Thaw in refrigerator or microwave. Keep raw meat separate from other foods. Wash working surfaces (including cutting boards), utensils and hands after touching raw meat. Cook thuroughly. Keep hot foods hot. Refigerate leftovers immediately or discard. Ingredients: Pork Salivary Glands, lymph Noeds and Fat (Cheeks), Pork, Paprika, Vinegar, Salt, Spices, Soy Four, Red Pepper, Garlic Powder, Sodium Nitrate. Serving size 2.5 oz (servings per container about 4). Calories 270 per serving (from fat 210). Total fat 23g (35% daily vaulue), saturated fat 8g, trans fat 0g. Cholesterol 65mg (22%). Vitamin A 120%. Cooking instructions: Remove casing, add desired amount of chorizo to cooking pan. Then, stirr the chorizo with a low heat for a minimum of 10 minutes or until it reaches a minimum temperature of 170 F. When the chorizo is thoroughly cooked, you may wish to add eggs beans, potatoes if desired. We only ship Pork Chorizo from Monday thru Wednesday so they don?t travel during weekends. With good chorizo being so hard to find locally, I rolled the dice and ordered this from MexGrocer. Happy to say it was beyond my expectations: good and spicy chorizo flavor, but much less surplus fat than I expected. Good stuff and worth ordering again. Had been looking locally for some time and finally found this resource. Worth the search! Nice runny, spicy Chorizo... the good stuff! Mix with potatoes for breakfast with eggs. or over cut spaghetti! I have it shipped to CT the chorizo around here is awful. This chorizo brings back the flavors of my youth....love making this with scrambled eggs...yummy! Chorizo and eggs burrto- Great morning starter; Highly recommended! ProsBuy 3 or more, than you can have it anytime! ConsNone? missing a great bite! I am pretty picky about this type of food that I have eaten all my life...so, I have already re-ordered on this product and really do like the way that it cooks up, the taste, the spices used. I would certainly recommend this to anyone who really likes to cook up chorizo con papas or chorizo y huevos. The only way I know to get better chorizo is to live in an area with a local source and then to find out how their final product smells and tastes. Best of eating to those of you guys out there who are like me in this regard...a long way from a good source. I love this chorizo won't eat any other kind. I just moved to Missouri and they don't sell chorizo out here!!!! Sad girl over here! El Mexicano Pork Chorizo- 9 oz. As good as it gets, tasty and delicious with eggs or anyway you choose to use it. I will definitely keep ordering this Chorizo. ProsAs good as any authentic Chorizo I've ever had. Taste is excellent. Melts in your mouth with just the right spices. Great with eggs & potatoes. ProsGood package size. Great Flavor. EXCELLENT!! Great pricing, quality, convenience, and most notably 'TASTE'!! Ww will definitely be ordering a variety of products from MexGrocer! Thank you MexGrocer for bringing 'down-home' tasting products like these to consumers!! Ever since we moved from California to Massachusetts, we have been really missing our Chorizo burritos! We are very thankful that we were able to get some shipped and that it was still fresh! Every time I go home to East Texas, I always pick a tube up to have for breakfast. Love the stuff! Keep up the good work! One of the best Mexican-style chorizo that I have had. It is rich and spicy. Will certainly buy it again. excellent! Wonderful, will certainly reorder this product! !